■Larsen, J. and Christensen, M. (2015) The unstable lives of bicycles: the 'unbecoming of design objects, Environment and Planning A, Vol. 47, 922-938. ■Larsen, J. (2014) (Auto) ethnography and cycling. International Journal of Social Research Methodology, Vol. 17 (1), 59-71. ■Steele, M. W. (2012) The making of a bicycle nation: Japan. Transfer 2(2), 70-94. 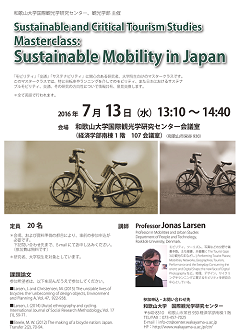 Professor in Mobilities and Urban Studies Department of People and Technology,Roskilde University, Denmark.